The ONC’s new program aims to engage consumers and increase the public’s use of HIT tools. 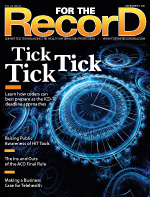 Healthcare records, too, are making the move into the digital age, with new HIT tools being adopted at a frenetic pace. As a result of more providers going electronic, the Office of the National Coordinator for Health Information Technology (ONC) is working to engage consumers through a recently launched program designed to promote these “newfangled” resources. Could direct access to lab results reduce communication between patients and providers? “I think [patients’] ongoing discussions with their physician will change, but I think it will change for the better in that they will be a more informed consumer,” says John Moore, managing partner at Cambridge, Mass.-based Chilmark Research, who anticipates patients with more information at their fingertips will be able to ask physicians more direct questions. Jarvis points to EHR and PHR adoption rates as one potential measure of success, along with clinical outcomes and “looking at the number of patients who say they’re actively engaged in maintaining their personal health record.” Those figures aren’t likely to be available anytime soon, but he believes it’s the kind of information that could be effective in gauging the program’s long-term progress. To its advantage, an electronic environment permits a baked-in audit trail that allows consumers to see who has accessed their information. Regulations also require that data breaches exceeding a preset threshold be made public, so the system and its integrity remain transparent. “I think it encourages the institutions that hold health information to be more careful and aware in safeguarding it,” Ricciardi says.